Perez Annihilates Hernandez in 2! Undefeated Colombian Darley Perez (25-0, 18 KOs) annihilated his opponent Alain Hernandez (18-9-2, 10 KOs) inside two rounds Friday night at the Double Tree Hotel in Ontario Ca. The opening round would see the Colombian work behind a quick jab and occasional right. 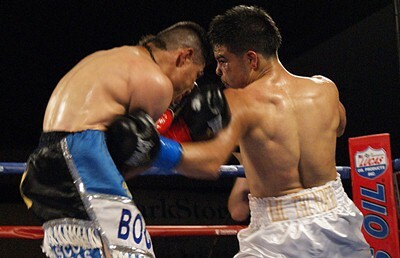 In the second, Perez let his hands go and unleashed a barrage of punches that rocked Hernadez midway through the round. At the ten second warning, consecutive right hands stunned Hernandez and put him on the canvas and nearly through the ropes. Referee Raul Caiz Jr. immediately stepped in and waived it off just as the bell rang, signaling the end of the round. Official time of the stoppage was 2:59. 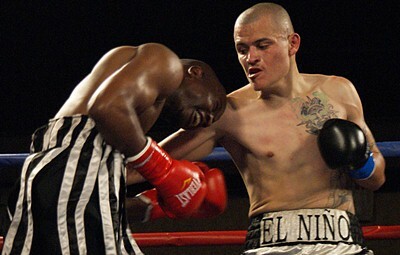 In the co-featured bout of the night, Riverside’s Jose Reynoso (16-2, 3 KOs) scored a seventh round TKO over a ‘hopeless’ James Hope (6-6-1, 4 KOs). After a slow, sloppy first round, Reynoso began to work the body which slowed the South Carolina fighter’s offense. The following rounds would see Reynoso continue to target the mid section and find his distance. After seven complete rounds, the ringside physician was brought in and Hope was deemed “unable to continue”. Hope contested the decision and claimed he could finish the scheduled eight rounds. Unfortunately, referee Ray Corona would call a halt to the bout at the request of the doc. Unbeaten featherweight Jonathan Arellano (12-1-1, 3 KOs) beat Jose Angel Cota (8-6, 6 KOs) into submission after seven complete rounds. The younger and faster Arellano battered the Mexicali MX fighter at will, landing accurate combinations that busted up the face and nose of Cota . A flurry of punches at the end of round seven discouraged Cota from answering the bell to start the eighth and final round. San Pedro’s Isaac Zarate (2-0) came out with a unanimous decision over a game Francisco Camacho (1-1, 1 KO) after four rounds. A shot to the gut floored Camacho in the opening round but he was able to beat the count and outwork Zarate in the second. Zarate would go back to the body in the third and continue the assault in the fourth to earn scores of 40-34 and 39-36 twice. Welterweight Joshua Conley (2-0, 2 KO) scored a second round TKO over Eduardo Herrera (0-5) at the :40 mark. A right hand wobbled the legs of Herrera and sent him into the corner where referee Raul Caiz Jr. stepped in and called a halt to the action. Featherweight Alex Chavez (1-0) was successful in his pro-debut, scoring a unanimous decision over Edgar Flores (0-6) after four rounds. Scores were 39-37 and 40-36 twice. 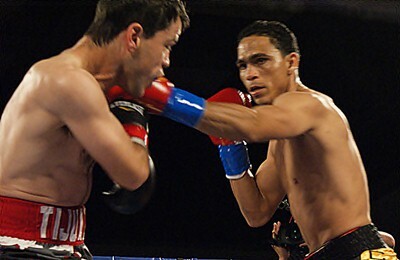 Featherweight Carlos Chavez (1-0) scored a four round unanimous decision over Mauro Brenes (0-2) in his pro-debut. All three judges were in agreement with scores of 39-37.